When Mulberries hit peak season and I’m walking down the edge of the woods and every other tree is a Red Mulberry with branches Loaded down with big, juicy, thumb size berries, as rich and black as any blackberry you’ve ever seen, it’s hard not to feel like I’m walking in the garden of Eden and that the whole world was made just for me. Mulberries often produce so prolifically that, after freezing several pounds, dehydrating several more, and eating raw ones for breakfast every morning for weeks, I run out of things to do with them. The idea of mulberry BBQ sauce had been rolling around in the back of my mind for some time. I finally decided to do the experiment and the results were fantastic! In a medium pot, bring 2 cups mulberries and the chicken stock to a simmer over med/high heat. Cook about 6-7 minutes. Mash them well in the pan. You can Press them through a mesh strainer to remove seeds if you really want to, but mulberry seeds aren’t like raspberry or blackberry seeds. They break down easily and I hardly notice them at all. Bring sauce back to a simmer over medium heat. Add the rest of the ingredients to the pot and continue to simmer until sauce is well thickened. Remove from heat and allow sauce to cool. Mash in the remaining 1/2 cup of fresh mulberries. This is optional, but I love the chunky look it gives the final product. Enjoy! I made this barbecue sauce last night and it was the most wonderful thing ever! 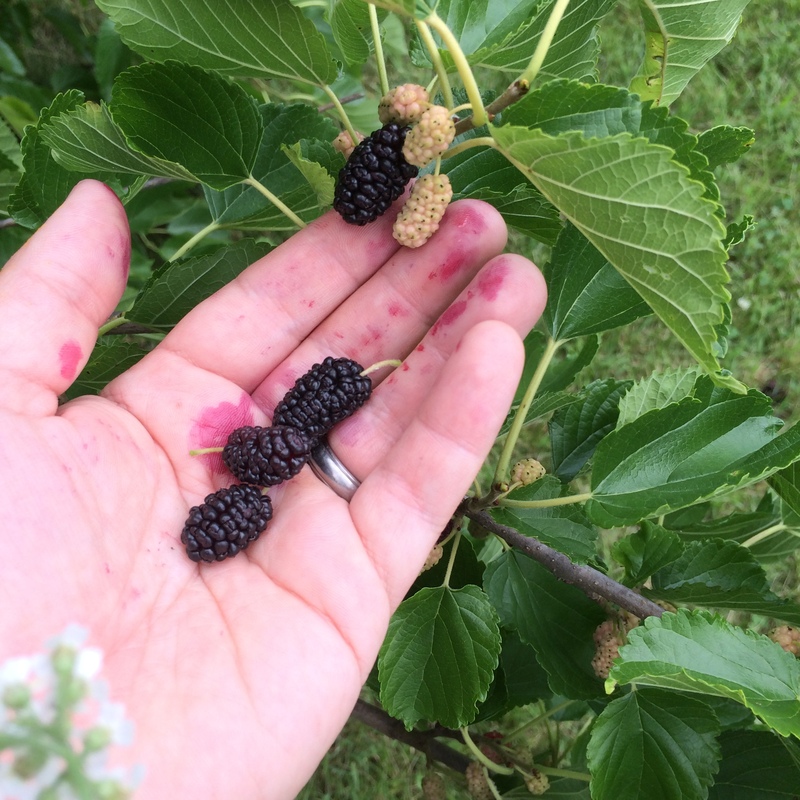 We didn’t get enough mulberries for even one batch of jam (the birds, groundhog, and hail got most of the berries from our two trees) and I was so pleased to find this recipe! Thanks very much! How much does this make and can I can it using a water bath method? This recipe makes about a quart, maybe not quite. I’m not sure if it would be acidic enough for a water bath can, so you might want to add some lemon juice to it or pressure can. Best of luck! I was wondering if you ever did can it and how it worked? I was thinking of doing the same. I have never canned it, no. Considering the vinegar, I would assume that it would be acidic enough for a water bath canning method to work. I’d love to hear your results!